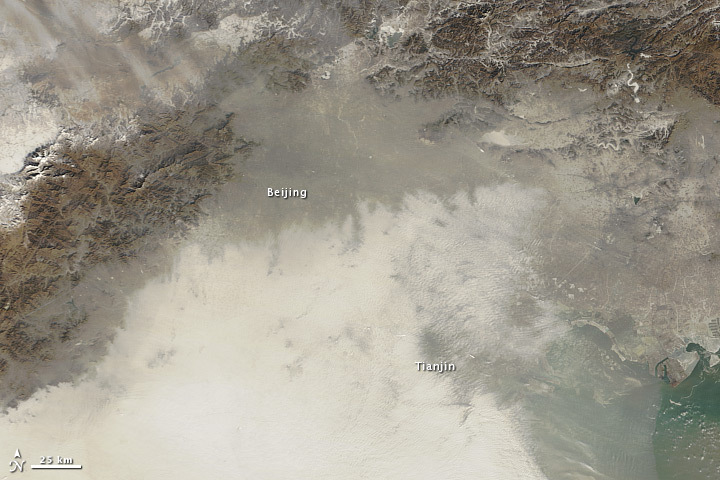 By comparing the two images, there is a distinct different between the visibility of geographical features caused by the massive haze lingering over China. The image on the left is much more blurred than the image taken earlier on the right. 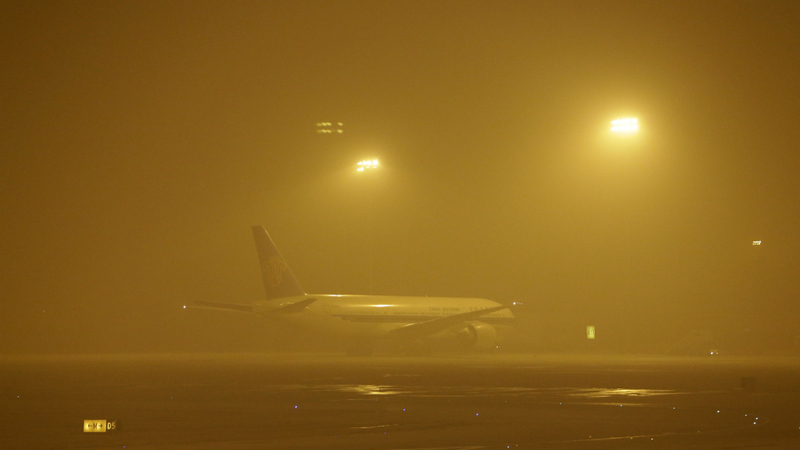 This decrease in visibility has prompted hundreds of flight cancellations around the country. The aviation regulator instituted new rules requiring senior pilots on flights into and out of Beijing to be able to land in low visibility. According to officla Xinhua news agency, the visibility was less than 100 metres (109 yards) in some areas of eastern China. If you picture yourself doing a 100m race, the visibility range would render you unable to see the finish line. Air China cancelled 14 domestic flights in or out of the Beijing airport, and an airport in the eastern city of Qingdao was closed, cancelling 20 flights. The disruptions came in the first week of the country's peak, six-week period for travel, linked to the 10 February lunar new year. Every year, China's transport system bursts at the seams as tens of millions of people travel for the holiday, in the world's largest seasonal migration of people. 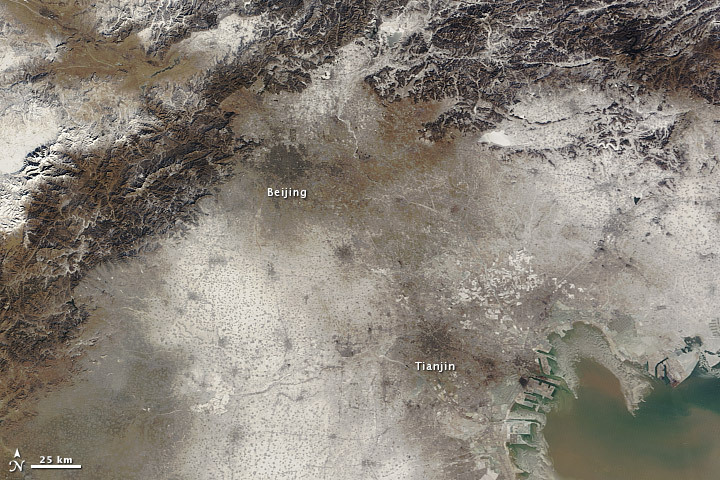 Where did this air pollution come from in Beijing? "In the past, the World Bank has projected that China loses 4.3% of GDPto health costs associated with air and water pollution. But that’s always been abstract. This year, China’s economy took a hit on numerous fronts due to air pollution. Tourism, for instance, has begun to suffer, as Beijing saw a 15% decline in overseas visitors in the first half of the year. " During Chinese New Years, Beijing encouraged residents to lay off the holiday tradition of launching fireworks, causing a 37% drop in fireworks sales from the previous year. The government also made the questionable move of cracking down on Beijing’s outdoor barbecues. Required heavy polluting enterprises to reduce emission by 30%. Among them, 58 key enterprises (involving building materials, metallurgy, and chemicals) under emission reduction monitoring have stopped production, and 41 enterprises have reduced production and reached the 30% emission reduction target. Construction was suspended at 28 construction sites and 54 businesses reduced their emissions by 30%, with Beijing Hyundai Motor Company halting production on Sunday, the Beijing Municipal Environmental Protection Bureau said. Required 30% of vehicles owned by the government agencies and government affiliated institutes to stop running on the road, and provide more public transport in the mean time. 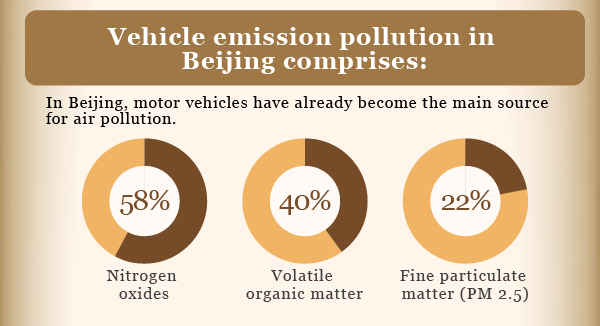 "Beijing has now included timely reporting of air quality data, through various avenues. The air quality data reported to the public is already consistent with the revised air quality standards (GB 3095-2012), even though national implementation is still in 2016. The Air Quality Index (AQI) provided by Beijing Environmental Monitoring Center (BJEMC) already includes PM2.5 (equivalent to (WHO) Interim Target 1 (IT-1) (70 µg/m3). 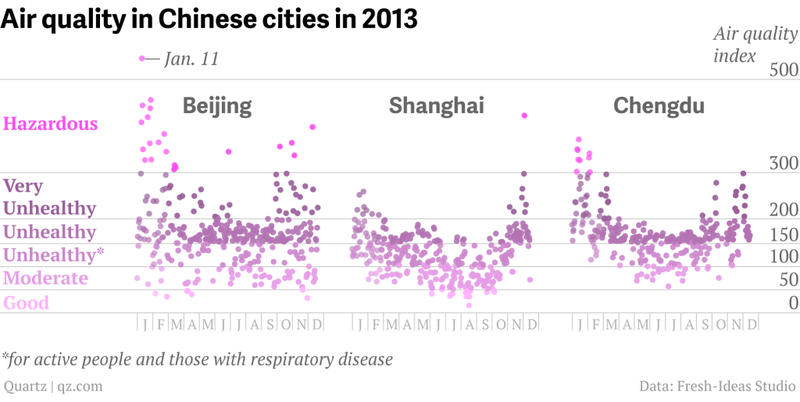 This shows that Beijing is releasing data linked with health implications to public." The BJEMC website (http://zx.bjmemc.com.cn/) provides detailed information on air quality levels per station and per pollutant in the city including PM2.5 - (fine particles). The reduction of launching firework through encouraging is certainly a fair method of responding to the immediate situation as seen through the 37% drop in firework sales. Fireworks and crackers generate a variety of contaminants, including gases such as carbon monoxide, sulfur dioxide and nitrogen oxide, in addition to aerosols of micro particles known as particulate matter. The difference between fireworks and other pollutants is that fireworks have a wide coverage of area after launching, meaning that the pollutants are spread faster. However, a better way would be to prohibit the launching of fireworks during Chinese New Years. This may negatively affect some business, but this approach is needed for a effective response. The Emergency response plan implemented by Beijing seems to be fairly effective overall. Sending fourteen inspection teams to 14 districts to oversee pollution measures is an effective way of ensuring the measures are carried out properly. Moreover, halting spot to Tuesday was a very obvious approach to take, but simply halting it to Tuesday in "extreme pollution areas" is a horrible choice as they should take into account the scenario that the crisis does not calm down within two days. A more reasonable halt would be halting sport for primary and middle schools for at least a week then making further readjustments if necessary. Suggestions provided to the public regarding health should be provided at all times but not part of the emergency response plan, a more effective measure would be to "strongly reinforce pollution-health related communication and information to public" Additionally, by targeting heavily polluting enterprises to reduce emissions and constructions, this acts as a very direct method of reducing pollutants. The direct effectiveness of this plan can be seen in figure 1.6 below where we can see a drop of hazardous air quality down to within the unhealthy range. Figure 1.6 is a result of the timely reporting act taken by the government, if not for this action, we would be unaware of the air quality. 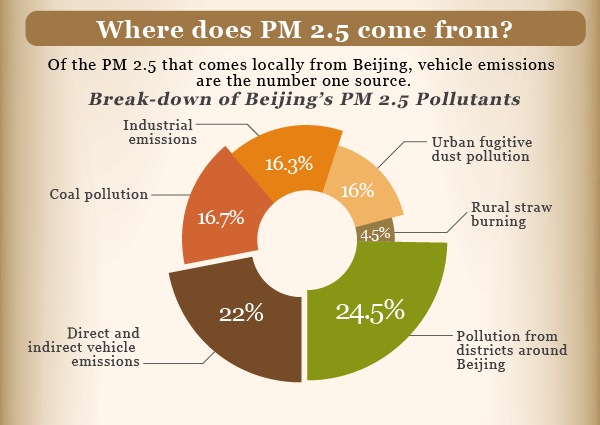 This action improves awareness of the PM level of air quality in China by timely reporting relevant data. The public should now be aware of when to venture out or not. This is no doubt a step towards improving health conditions in China. Ultimately, the emergency response plan was effective in controlling the January 2013 air pollution crisis but in order to prevent further similar episodes from occurring, long term solutions need to be adopted.